Badminton Asia welcomed news that badminton icon Datuk Lee Chong Wei is not quitting the shuttle sport anytime now and is even eyeing the 2020 Tokyo Olympics. Described as the best badminton ambassador not only in Asia but also the world, Chong Wei gave his first press conference at Academy Badminton Malaysia in Bukit Kiara on Thursday since he was diagnosed with early-stage cancer of the nose in July after the Indonesia Open in Jakarta. "It is good news, especially for badminton in Asia. However, his health is still the top priority for now," said Badminton Asia's chief operating officer Kenny Goh who was one of the many who attended the press conference. "Chong Wei is an icon in the sport and his decision to not the quit the game is something everyone welcomed. 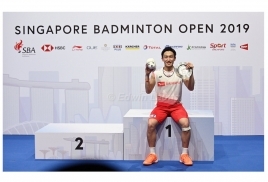 We in Badminton Asia are happy about the positive news as he is even eyeing the Tokyo Olympics (2020). "Still, his health comes first and I believe he still has some years of competitive badminton in him...if his health permits." The 36-year-old Chong Wei is recovering from an early stage of nasopharynx after undergoing treatment in Chinese Taipei. He still needs to do follow up treatment and needs medical clearance from the doctors before he is allowed to return to court training. Chong Wei revealed that he has already started doing light workouts and training at home to build his body muscles after losing five kilograms during treatment. The former World No 1, who was in a jovial mood, revealed that the treatment in Chinese Taipei was "painful" and underwent 33 sessions of "Proton therapy" which left scars on his neck that made it difficult for him to eat. "I cried for a week when I first came to know that I had nose cancer...but I came through the battle after a difficult period. I thank my wife (Datin Wong Mew Choo), my family, my mother and my brother and all those who sent text messages," said Chong Wei. Chong Wei is eyeing a return to competitive badminton next year and hopes to play in the All England Championships in March as his first tournament. "I am eyeing a place in the Tokyo Olympics which will be my fifth Olympics. 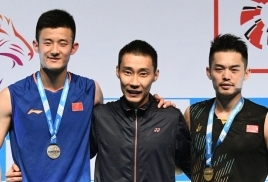 The Olympic gold is in mind," added Chong Wei who won silver in Beijing (2008), London (2012) and Rio de Janeiro (2016).